Depose the Bowline: the Winner! A lot of you took the time to write in your nominees. Some entries were haiku-like in their brevity; others ran to pages of comparative analysis (I’m looking at you, Andrew Schmitz). Likewise the knots ran in complexity from the barely-a-knot round turn to an exceedingly complex knot that we will get to a bit later. But it was clear that everyone who wrote in had given the topic some thought, sometimes a great deal of thought. And this is appropriate, for knots are – or can be – extraordinarily powerful, elegant tools. For this contest, I also invited you to be a champion for your knot, to convince a panel of judges why your choice had the best chance of usurping the Bowline as the King of Knots. We were looking for global relevance, usefulness, and deserving-to-be-better-known, but we were also looking for passion on the part of the nominators. Some of you didn’t really bother with this part. Others included photographs of long ago sea cruises, told tales of using your knot in dire and happy times, or sought to bowl us over with pithy bullet points. I can tell you that this aspect of the contest made the difference in what would otherwise have been some very close calls. And even with your commentary, it took our judges quite a bit of time, pizza, and beer to come to a consensus. On the other hand, our task was made easier by the fact that many very deserving knots were either mentioned only briefly, or were not submitted at all. Given the enthusiasm of the response we got, I think it would be a good idea to make this an annual event; perhaps next year we will get to review some of the great knots that didn’t make it into the hopper. All hail Des Pawson, who distilled his multi-thousand-knot vocabulary to a pithy commentary on the Figure-8 “family,” and an even more pithy secondary recommendation for one of my favorites, the Constrictor. Special mention to Captain Gaelen, who came within a whisker of winning with his entry, the Directional Figure-8. This knot can go head-to-head with a Bowline in almost every respect, plus it is really easy to learn, holds perfectly in high-modulus rope, can be made anywhere in the length of a rope, and is an ideal Trucker’s Hitch loop. It was edged out only because it can require some effort to untie after a heavy load, and because it isn’t quite as versatile as either the Bowline or the eventual winner. 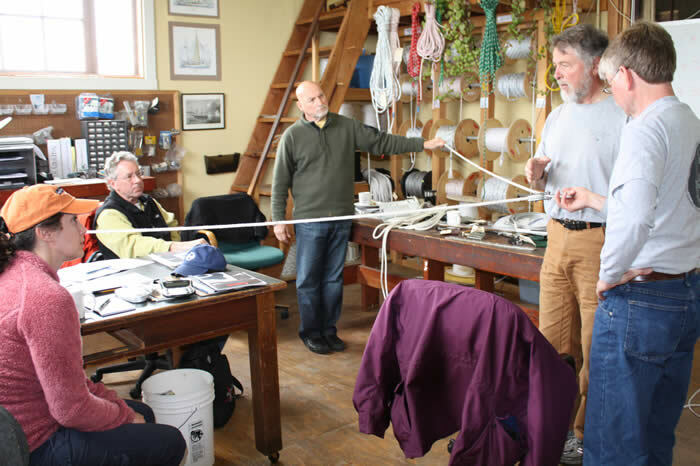 Kudos to Chris Baschab, fan of the Zeppelin Bend, who included how-to-tie instructions. Likewise to Joe Scmidbauer, who said that, “…a round turn will and should be your constant companion.” True, Joe. Thumbs up to to Lee Youngblood, wise in the ways of tying fenders to rails. High marks to Tane Hardwick, rope access maestro, who made a compelling argument for the Barrel Knot. A nod to all of you who proffered the Trucker’s Hitch. This was a tempting one, scoring strong in all of our categories, but ultimately we concluded that it isn’t a knot, but a combination of knots, with a dozen or more distinct options at the central location. Maybe a topic for another contest. There are a couple of other honorees that I’ll get to, but first, it is time to announce our winner, Mike Brough! His nominee, the Capstan Hitch (see Featured Image, at top of page), also known as the Tugboat Hitch and several other names, scored high in all categories. Like the Bowline, it is extraordinarily versatile; unlike the Bowline it is better than mediocre at everything it does; it is a maximally secure, jam-proof belay, it can be used – among many other things – to start a lashing, or to finish one (adding to lashing tension as it does so). It can be tied and untied with a load on, it can be made to a variety of objects, at any orientation, anywhere in the length of a rope, and it is quick in the making, either with a bight or with an end. Further, it belongs to the Pile Hitch family of knots, which includes, among other knots, the Icicle Hitch, the Smith Marlingspike Hitch, and what mountain climbers call the Munter Hitch. 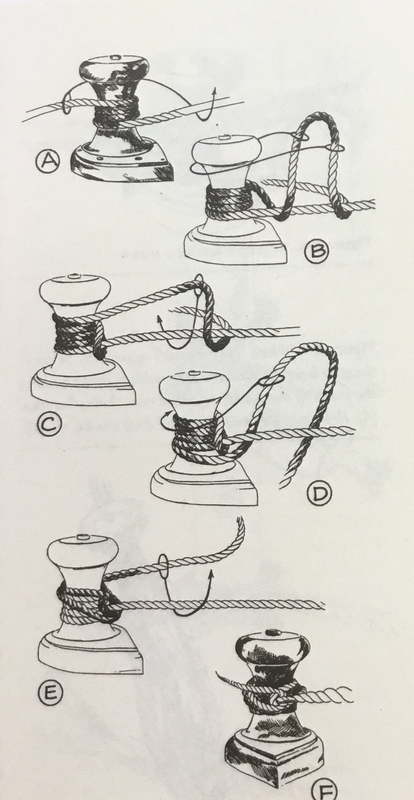 You can make use of the Capstan Hitch afloat and ashore (it’s the classic way to anchor one end of a mason’s line), and given how valuable it is, it is amazing that it is so little-known. If you would like to get to know this knot, the best source would be, um me (see below for a link to our online store), but you might also look Here, on Mike’s site. Congratulations, Mike. 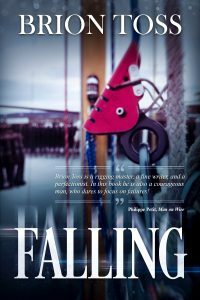 Be in touch about your prize, an autographed copy of Sea Trials, from author Wendy Hinman. After much hard thought, and more than one rather hoppy IPA, the answer to the puzzle became apparent to me. Certainly a round turn may have save the day, and perhaps a Bowline on a bollard waxes poetic, and maybe some complicated slippery hitch may awe the drunken hordes on the jetty, but there is, without any question, only one most-important knot in a good sailor’s inventory, and that is the very simple bow. It’s arguable that more boats have been lost due to a lack of diligence in tying this simple knot around a small box than from all other causes of nautical disasters in history. I and all the other judges missed Richard’s point during our meeting, and it was only in reviewing the entries for this post that I finally got it. We thought he meant the bow knot, as in tying your shoes on, but he was talking about far more profound unions: those between people. When I was new to knotting, I became obsessed with it, to the exclusion of everything else, including people. This is understandable; knots, in their bewildering array of forms and uses, are worthy of a lifetime of study. But they are only tools, after all, and tools are what we use to make our lives better, and our lives are always better when we love one another. So learn to tie a bow, and tie it “around a small box,” to give to someone you love. Our final Honorable Mention is very honorable indeed, sufficiently so that I will be giving him his own platform this Friday morning. Look for “In Praise of the Star Knot. Bring a hanky. To see how I like to tie knots, including many of the ones above, visit our Online Store. 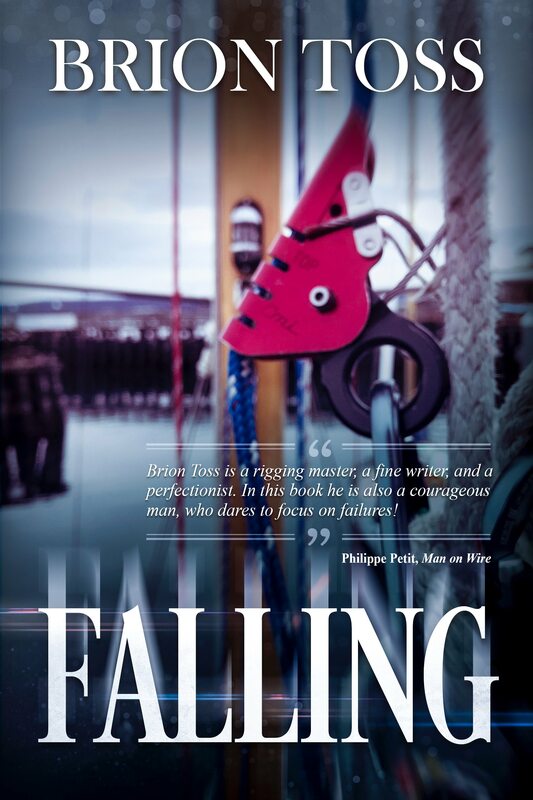 “25 Knots” is the DVD, “The Rigger’s Apprentice” is the book. Lots of other fabulous rig-related merchandise there. As always, I invite you to comb through all of the past articles and puzzles in my Blog. Subscribe below to get notifications of future posts.